How to Stop Your Puppy from Biting - Petpav - Your Online Magazine for All Things Pet! 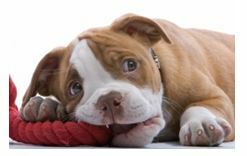 If you have ever owned a dog or puppy, you already know that one common trait in puppyhood is biting. Puppies bite to help relieve the irritation from teething and to learn about the world around them. When dogs and puppies play, they use their mouth and paws. As a new puppy owner, it is necessary to determine what is and isn’t acceptable behavior from the very first day. Puppies benefit from expectations that are consistently enforced. Teething lasts from four to six months, so mouthing is quite common then. If mouthing has not gotten under control by the time the puppy enters adolescence at six months, not only will you have a less cooperative teenager to handle, but a larger, stronger jaw to deal with as well! It is important as a pet owner to make sure that your puppy learns that biting is a ‘bad thing’ or you could end up with an adult dog that grabs and bites you. It doesn’t matter how cute your puppy is and how little it hurts or just pinches. If he’s always trying to gnaw on something or someone, it can become a problem. Below are some tips to help you with the ‘biting’ issue. Puppies want to gnaw on things, so make sure that you have plenty of toys that he can chew on, carry around, and pull apart. If he’s bored of the ones that are currently on the floor, rotate them with some different ones. This is a good habit to get into as it always makes the toys seem new to him. Indestructible chew toys like large nylon bones or hard rubber Kongs’ can provide a positive outlet for mouthing. Large rawhide bones and carrots can be placed in the freezer and given to a teething puppy. Braided fiber knotted tugs dipped in chicken broth or water and then frozen are also a good option. However, while you are trying to stop your puppies from biting, don’t ever play tug of war, wrestling or chase type games with them. This only encourages the biting and nipping as your puppy will think it’s a game. And you can hurt your puppy by doing so. When a puppy bites another puppy or dog, he is usually reprimanded with a loud yelp from the other dog and sometimes a growl. This is a clear indicator that playtime is over. It may take a few yelps to get the message and sometimes the other dog will leave the area or walk away. When you are training your puppy, try to do the same sort of action to teach your puppy that it is not ok to bite. Try yelping in a high-pitched tone and withdraw your hand or whatever part of your body your puppy has nipped. Don’t be afraid to exaggerate your yelping to startle him. He might give you a look and stop. Use this opportunity to give him his chew toy. It’ll reinforce that it is ok to chew on the toy and not you. If your puppy persists on biting, simply walk away from him or her. Ignore him and do not talk or touch him for a few minutes. Expect him to cry, try to follow you, and grab your pant leg to get your attention. You can even leave the room and close the door for a few minutes. He might scratch and whimper. When you come back into the room, you should stay calm and try to not arouse his play behavior. He may still want to play. If this is the case, simply give him a toy. If he ignores the toy and goes for your hand or sleeve, repeat the yelping and walk away. Just remember that it is important that your puppy sees you as his parent. A puppy needs to understand that you’re the one who guides and teaches him. It starts with biting and can be attributed to all puppy/dog behavior. If you can curb this behavior early in your puppy’s life, it will only help your puppy to become a well behaved dog.